This page is the complete description and details for the summer camp Logistics Director position including job responsibilities, dates, wage, etc. At the bottom of the page you can apply online and download the complete pdf job profile. Reports to: Camp Director and Central Office Directors. Responsible for: Camp Drivers, Maintenance, Kitchen and Cleaning Staff. In each camp there is a campsite director who is the overall responsible for that camp, and everything that happens in that camp. In Family Camp Puerto, due to the size and multi-faceted nature of the camp, there are two directors. The campsite director is still the overall responsible, but they are helped out by the logistics director who is responsible for the more “non-programme” side of things, that is to say they are responsible for the areas that don’t affect the kids but that are very important for the running of camp. These areas include the management of the maintenance team, cleaning staff and drivers, the management and communication of the external catering company and catering staff, the communication and organisation of all offsite suppliers and extra-activities. This person will also be the person who is responsible for the logistics of the arrival and departure of day campers each day. The purpose of the logistics director position is to cover all of the tricky non-programme areas so that the campsite director can focus on the activity, tefl and welfare areas, and the management of the different coordinators. Logistic directors need to be young, or young at heart, individuals in order to meet the extraordinary demands of camp work, while also having a mature and responsible outlook to be able to take on the responsibility for this management position. To oversee the organisation and quality of all sub contracted suppliers. This includes extra activities, like padel, done off-camp and also on-site based suppliers like: maintenance, cleaning and catering. To oversee the organisation and quality of the catering supplier Sodexo and be responsible for all communication. To ensure that all pick-ups and drop offs and all other driving tasks are carried out by Camp Support. To oversee all picking up and dropping off of Day Camp campers each day and the communication with parents. To work alongside other management staff in ensuring the success of all parts of daily life on camp. Do daily checks of camp site to check for maintenance and cleaning problems. Communicate daily to maintenance jobs needing done and oversee that they are completed. Do daily checks of camp site, checking that areas have been cleaned and broken things repaired. Communicate daily with cleaning staff on problems and oversee that they are completed. Monitor camp meals and give kitchen daily feedback on success/quality of the food. Meet weekly with kitchen and cleaning/laundry responsibles as required. Meet weekly with TECS Catering monitors and manage them in their non-catering responsibilities. Monitor the daily taking of staff and camper laundry and deal with situations of loss and damage to clothing as a consequence of the laundry. Ensure the quality of all extra activities, visiting them when necessary and giving them feedback on the service provided. Manage the extra-activity monitors in all areas of their extra activity responsibilities. Pass on update lists to both extra activity suppliers and monitors, informing them of all changes as they happen. Oversee the pick-ups and drop offs done by the camp drivers and, if needed, by maintenance or camp staff. Daily give information to drivers about supplies that need to be bought or picked up in El Puerto, this should be done in coordination with the Camp Site Director. Daily inform drivers of driving schedules for non-multi-activity transfers. Oversee the loading and unloading of kids from non-multi-activities, ensuring the responsible staff have up to date lists of children doing non multi-activities. In situations of need, act as a camp driver. Make changes to lists as they occur, changes of: age groups, bedrooms, arts and crafts and sports groups and colour teams. Ensure all non-multiactivity lists are produced weekly and that numbers are passed on to all extra activity suppliers and responsible monitors. Ensure the kitchen has up-to-date lists of all dietary issues and all food requirements weekly. With Camp Director, allocate staff to excursions and arrival and departure assignments. Ensure that drivers are doing assigned day camp pick-ups and drop offs as needed to/from Jerez and Cadiz. Ensure that parents are being attended in the morning and afternoon so that they can drop off/collect their kids at each of the three day camp moments each day. Ensure that any issues communicated by parents of Day Campers are being registered in the observaciones system and reaching the appropriate welfare coordinator. Take part in meetings held before the start of camp. Familiarise yourself thoroughly with all parts of the job before the start of staff training. Run driver’s and parts of camp support training programme. Run the extra activity monitors training in the extra activity area. Run any parts of the training week as assigned. Represent the camp in a positive manner at all times. Before each arrival and departure day, in coordination with maintenance staff and camp director, ensure the camp site is properly prepared for the arrival of parents and children. Also carry out admin jobs in preparation for the said days. On Arrivals and Departures days oversee all camp transfers. Meet daily with Camp Site Director to inform them about job progress and ask for assistance as needed. Communicate daily with cleaning and maintenance staff on problems and oversee that they are completed. Meet weekly with kitchen and cleaning responsibles. On excursion weekends, the logistics director will work on intercamp day ensuring that all catering needs are looked after. Reading the camp manuals, http://www.tecs.es/employment/, and familiarising yourself with all areas of the camp before your arrival. The hours of work for a Logistics director are not set and are instead dictated by daily events. All candidates should be prepared to have an open work schedule and be prepared to work long hours, particularly in the initial stages of camp, to get jobs/tasks finished. Daily time off, will be dictated by the individual day as stated, but when possible will usually be taken during the sports sessions and/or in the evenings. The Logistics director will have one day of each week at the weekend. All staff are also always required to stay on site at night on pre-departure Fridays and on all Sundays. Management Bonding Meal at before camp starts and reward meal at end of summer. Regular feedback will be provided from the Camp Site Director and/or Central Office about job performance and objectives. Also the Camp Site Director or Central Office will be available at any time to discuss concerns or problems that may occur. Preferred previous experience on summer camps. Preferred experience of administration like work, but not required if candidate has a good knowledge of computers and modern computer programmes. Experience of working alone and being responsible for completing important tasks with limited support or supervision. Experience of working in a fast moving environment where stress levels can at times be very high. Experience of dealing with emotional problems of Spanish children and parents. Applicants with recognised qualifications in English, First Certificate and above, will be looked upon favourable. A high level or fluency in Spanish and English and a good knowledge of the culture and customs of both countries. Competent knowledge of Microsoft Office package and preferred experience of using Databases. First class interpersonal skills, with ability to communicate effectively with: fellow employees, parents and children in both English and Spanish. High energy levels and a young but responsible and mature outlook on life and work. May be invited to attend our annual training planning weekend for managers where we focus on getting things ready for the summer, developing our management teams, and bonding the teams. The approximate date is 6+7th May 2017. Arrive on Sunday 18th June 2017. Management Training Week: 19th-25th June. Staff Training Week: 26th June – 1st July. Camp Work Start Date: 2nd July (camper’s arrival)*. *As this is start of camp, this is the start date which will appear on Spanish contracts. All management staff receive 200€ for their responsibilities during the training weeks (Getting trained and running the staff training week). 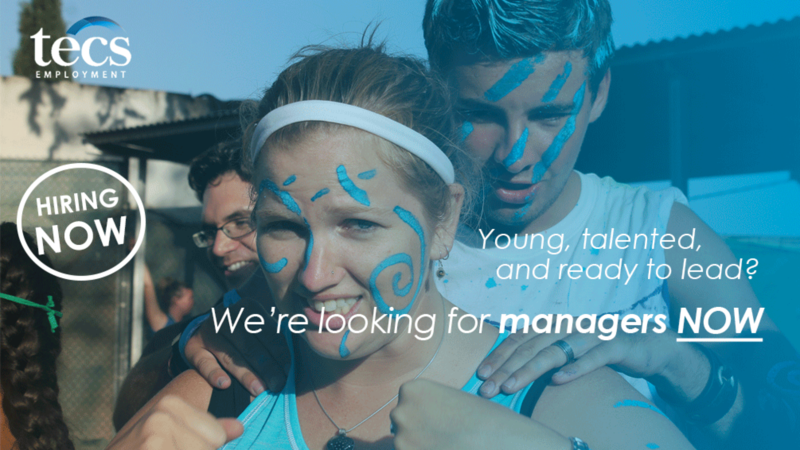 Management staff who don’t attend the full management week but do attend management training weekend and run staff training week and do attend an extra training day, will receive 100€ in place of 200€. All meals will be provided from the beginning of staff training weekend, and some but not all before then. As we believe in team bonding there will be social events organised in the evenings during Management training week, including the Sunday arrival evening, which you are expected to attend in order to create the best management team possible. Performance Bonuses: This is a possible performance related bonus. TECS provides standard reference gradings (Exceptional (E), Very good (VG), Good (G), To Standard Required, Below Standard Required, Unsatisfactory) and believes in reward staff, with the bonuses stated above, should their performance be deemed to be above the minimum standard required (i.e. Good and above). These bonuses will be based on the reference grading as decided on by the camp director. An employee is NOT entitled to any bonus should they be deemed to have done a performance that is deemed to be “To Standard Required”, “Below Standard Required” or “Unsatisfactory”.